An economical choice of function and price. Ideal for the aspiring trombone player, it works well for an advancing trombone player and may be used by a professional. Height adjustable trombone stand with adjustable spring loaded bell cup. Spring loaded bell cup for cushioning 'hard landings'. Adjustable bell cup location. Collet adjustment is fast and secure, can adjusted height from 29 1/2" to over 40". 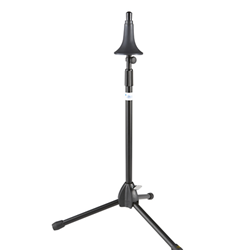 Mic stand style hub and tripod base. Folds to about 29". Supports both tenor and bass trombones. Durable black powder coated finish.